Mansfield Town v Wycombe Wanderers. 'Matt Green celebrates his equalising goal. 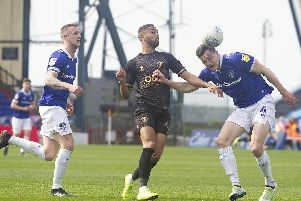 Matt Green’s lethal finishing ability saw him become Mansfield Town’s hero for a third game in a row as he bagged a late point in Stags’ otherwise disappointing 1-1 home draw with Wycombe Wanderers on Saturday. Green, consigned to the bench for a fifth game in a row, had come on to score winners in the previous two. Rather than knocking on the manager’s door about a recall, he is now practically smashing it down with a sledgehammer after Saturday’s latest success. Boss Adam Murray had a big decision to make on Saturday – did he restore Green into the team or use him in the sub role he has suddenly become so effective at? An illness earlier in the week for Green helped make Murray’s mind up, but Green must now believe he has done enough to earn his recall at Luton on Saturday. The worry on Saturday was always that it could turn into another ‘After The Lord Mayor’s Show’ after the scintillating 3-1 derby win over Notts County the week before. Click HERE to see a slideshow of pictures of Stags fans last weekend - can you spot yourself? It was never quite that bad, but the first half was nothing to write home about against a Wycombe side that hasn’t won away all season. It might all have been so different had Pat Hoban hit the net on 11 minutes after being sent clear by Danny Rose. But, having rounded the keeper, he saw Danny Rowe clear off the line. Hoban fired another chance wide from Mitch Rose’s pass later in the half. But, otherwise, Stags failed to cause Wycombe enough problems, despite Murray going with three at the back and giving Mal Benning and Rhys Bennett licence to attack as wing backs. Instead they found themselves having to defend as Scott Shearer parried a Dominic Gape shot and clawed away a header from the ever-intimidating frame of Ade Akinfenwa. On 21 minutes Paul Hayes sent a low ball in front of goal where Matt Bloomfield slid in too late to make contact and Paris Gowan-Hall could only turn wide at the far post. It was a let-off that went unheeded as two minutes later Wycombe were in front. Hayes this time sent Bloomfield away down the centre with a cutting first time pass after Oscar Gobern had been easily dispossessed, and he calmly beat Shearer from 14 yards. Murray was furious with his side’s lack of communication and spark in the first half and withdrew disappointing pair Gobern and Danny Rose at the break to introduce Jack Thomas and Green and sent them out very early from the break with his words ringing in their ears. It certainly did the trick as a one-way traffic second half saw Stags create a wealth of chances, taking just the one in the end. The wing backs both came close, Benning, enjoying one of his best games of the season, seeing a curling shot well saved as well as a free kick while Bennett headed a corner wide and prodded another opening tamely at giant keeper Jamal Blackman. But a quickly-taken free kick by Lee Collins on 81 minutes initiated the equaliser as Benning’s ball in was nodded down by sub Darius Henderson and Green hooked in his fourth goal in three games from eight yards. In stoppage time Henderson thought he had grabbed the winner with a perfectly-placed header across the keeper from a Thomas cross. But the 6ft 6ins Blackman, still earning £13,000 a week while on loan from Chelsea, threw his big frame full stretch to his left to produced a tremendous save. The second half efforts at least kept the fans onside and Stags still a tantalising point outside the play-offs after what was a fifth game unbeaten. But it was also a fifth home game with Wycombe on the trot that they were unable to unseat the Chairboys and whether it proves to be a precious point gained or two vital ones dropped won’t be known until May.